Brochures are an inexpensive and effective marketing tool that will attract new customers to your business and are a great way to deliver your message. They can be used to organize your information, describe products or services and provide valuable information to your customers. 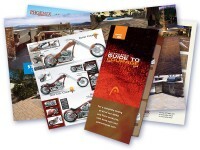 We can customize your brochure with a variety of layouts, panels, folds and paper stocks.